Hummus seems to be everywhere we look, especially when we’re trying to eat more plant-based. And why not? It’s super yummy, full of fiber and nutrients, and high in protein. Sometimes, however, we get tired of the regular every day hummus. That’s when it’s time to kick things up a notch, with this Spicy Carrot Hummus. Add some zing to your veggies or a veggie wrap, and snore no more — this hummus is a winner. This recipe is adapted from this recipe on Bon Appetit. Preheat oven to 425°. Place carrots in the center of a large square of foil and drizzle with 2 Tbsp. water. Wrap foil around carrots to make a tightly sealed packet. Place on a foil-lined rimmed baking sheet and roast until carrots are very tender, 40–50 minutes. Let sit until cool enough to handle. Alternatively, you could steam your carrots until tender. 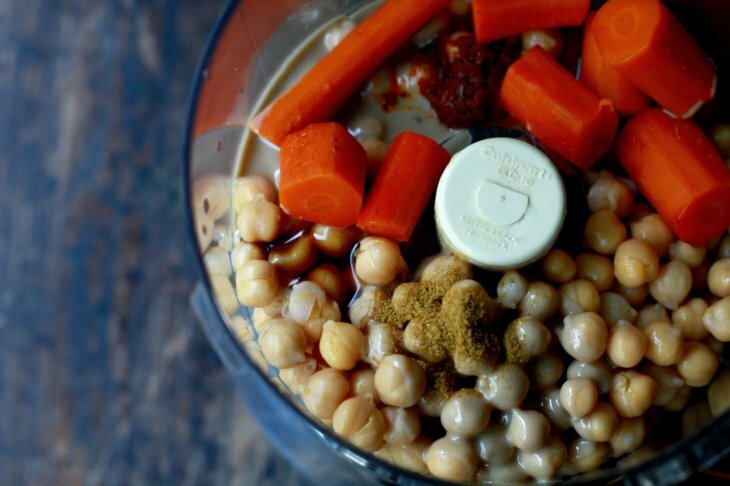 Add the roasted carrots, chickpeas, tahini, lemon juice, garlic, chili paste, salt, and cumin into the bowl of the food processor. Process until mixture is smooth, about 1 minute. Then, with the motor running, stream in 2 tablespoons of the bean cooking liquid. Process until very light and creamy. Next, stream in 2 tablespoons of olive oil, and process until incorporated. Continue to add a little more bean liquid to reach desired consistency. Taste, and add more chili paste to make hummus spicier, if desired. Then process to incorporate, just a few seconds longer. Add salt and pepper to taste. 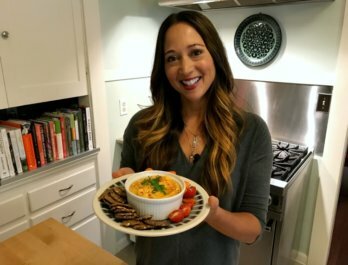 Transfer hummus to a shallow bowl. Top with pumpkin seeds and parsley, and drizzle with extra virgin olive oil. TIP: Hummus stores very well in the fridge, for about 4 days. Use throughout the week as a dip or spread for sandwiches and wraps. You could also use a couple tablespoons as the base for a quick salad dressing. Just thin it out with a little water, and you're good to go!